I am new to the concept of leaders/enders; I haven’t used them and don’t chain piece (yet). Could you please explain how you use the string blocks as your leader/ender project for this novice (who is always keen to learn something new)? I thought about replying in an email to her, but then realized that it was clearly time for another tutorial, because of all the photos I would be taking anyway. So, Lynne, here is the tutorial I promised all that time ago. I’m just sorry it took me this long to find time to sit down and write this! And, I’m sorry that the photos are dark. Now that I’m working two jobs, most of my sewing time is stolen from those hours that I should be sleeping! 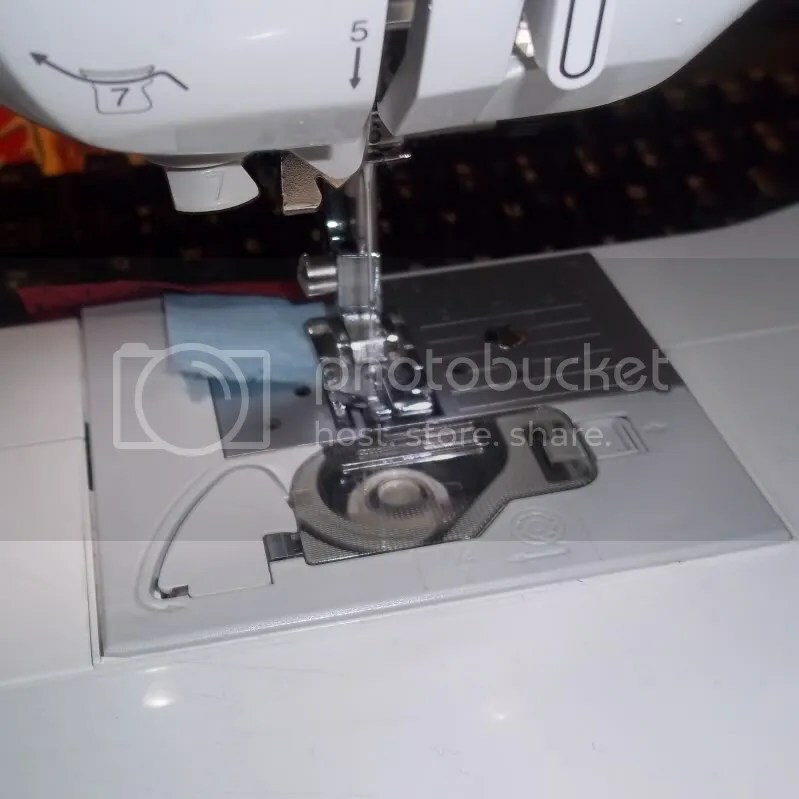 Let me preface the tutorial itself by saying that I typically use string blocks as the no-thinking portion of my sewing and to keep the machine running whenever I’m working on a block or series of blocks that require me to stop and start. 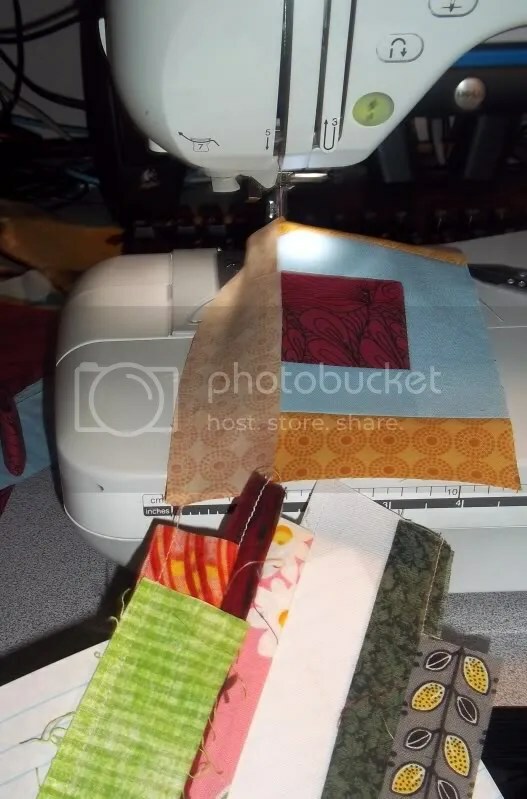 When I took the photos for this tutorial, I was working on blocks for the Test Your Skills Sampler (which I have to photograph and catch up on, bad me!). This means that I have the pieces pre-cut for whatever my primary project is. Pre-cutting is the only way that I’ve been able to maximize my time at the sewing machine lately, so this means that I have tons of time for string blocks too. Because of the sheer number of string blocks that I’ll need to complete a top, I simply bought a pad of lined notebook paper at my local office supply store while it was on sale for the start of the school year. At the same time, I went to the printing department there and had them cut the paper into 7″ squares for me. They can do up to 250 sheets as once, which totally beats my one at a time. I know 7″ seems like a weird size. I actually end up trimming the blocks down to 6 1/2″, for a finished size of 6″. There’s a little more waste this way, but this way I’m certain that I have enough seam allowance. 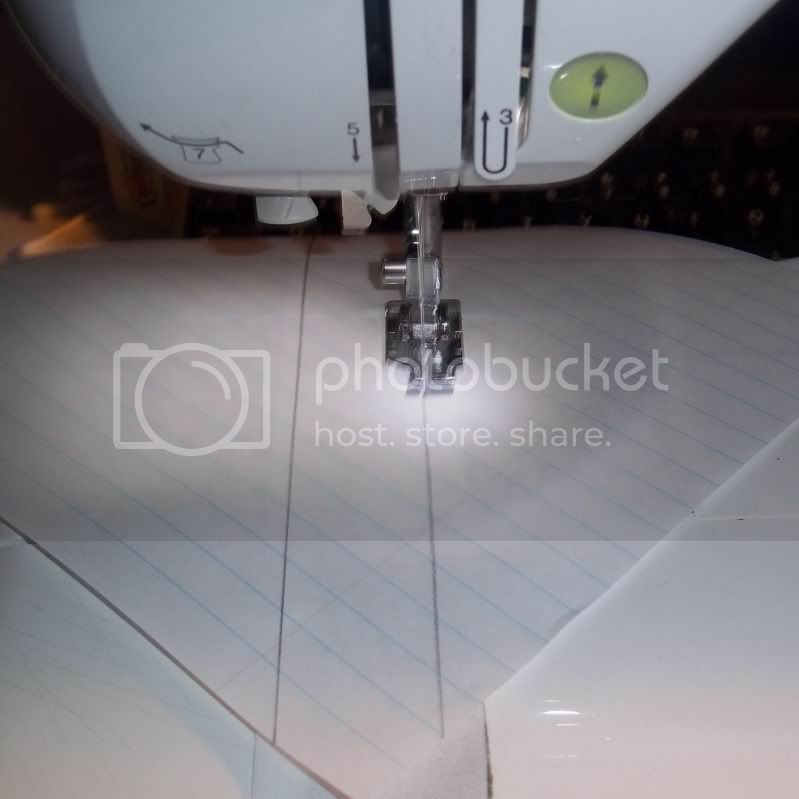 As you can see from the photo above, I’ve drawn my initial sewing lines on to each sheet. That middle portion of each block is a 1″ finished wide stripe of Kona White, to give the top some continuity (whenever it actually becomes a top). I pre-cut my strips of Kona to 1 1/2″. I really should remember, next time, to cut them at 1 3/4″, so that I don’t have to be quite so precise when placing the fabric for these first two seams. 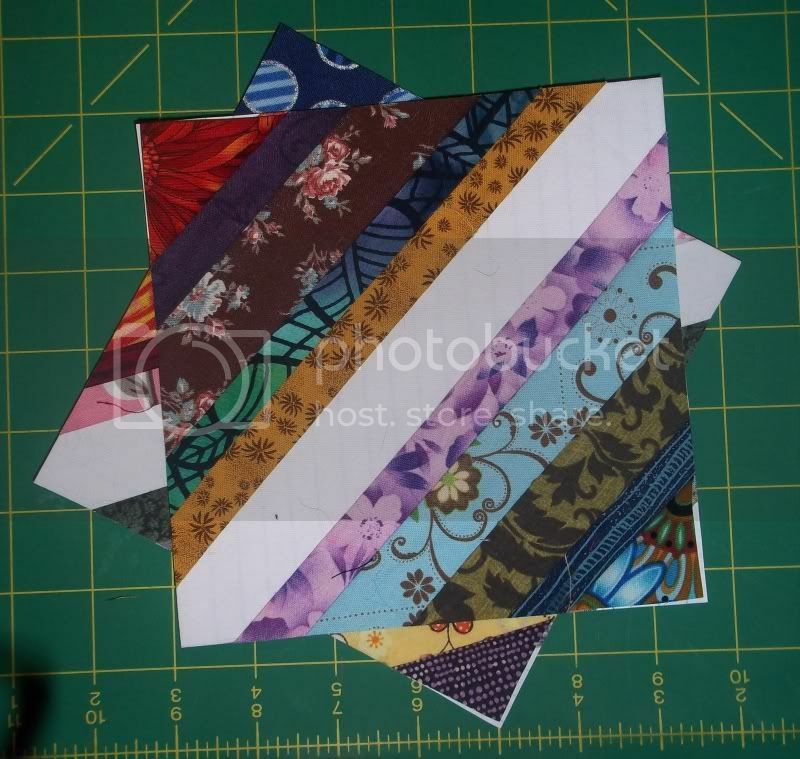 Some time ago, I reduced a bunch of my scraps to strips of various widths. I knew that I wanted to make a string quilt, but I didn’t want every seam to match up. 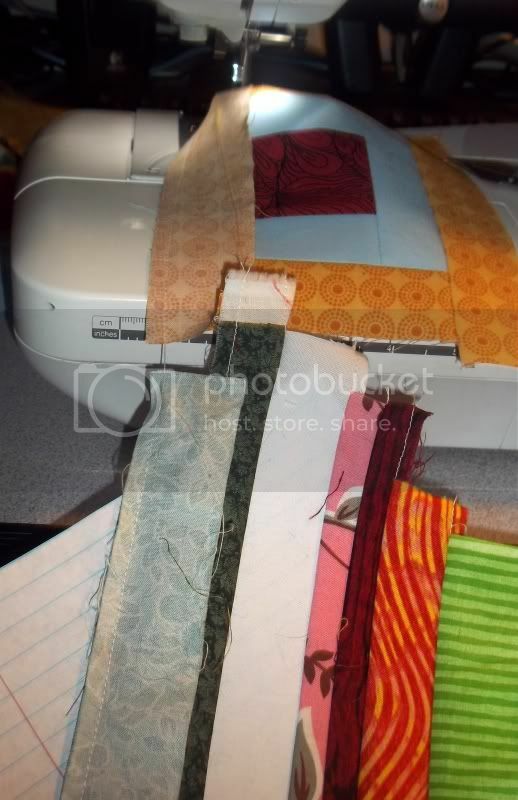 I wanted some variety, especially since I knew that my scraps wouldn’t all provide the necessary width to produce, say, 1″ strips. Some of my pre-cut strips start at 3/4″, so that the finished size is only 1/4″. Very little was too thin for this project. My favorite part about having all of these strips pre-cut is that I literally just threw them into a box. I blindly reach into the box, check to make sure the strip is long enough and sew it on if it’s long enough. Randomness is not a problem with this ‘organization’. Upon finishing that line of stitches, I lined up my white strip and sewed the first seam, right along one of those marked lines. Slight blurry photo below… Sorry! You can just barely see the edge of the green strip blow the white one in the foreground of this photo. 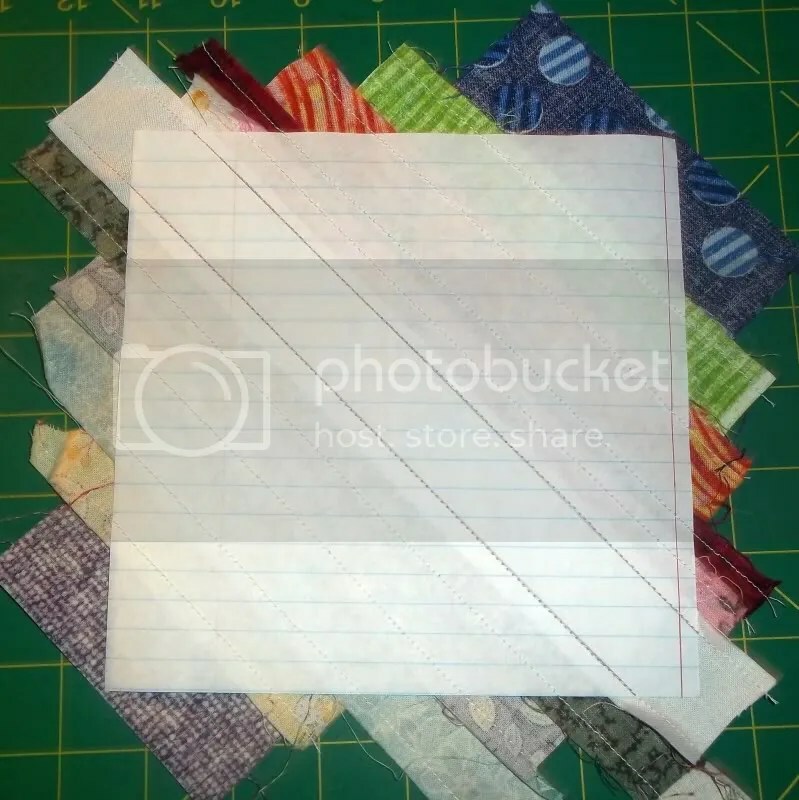 Right sides of the fabric should face each other, and the wrong side of the center strip will be flush against the paper. 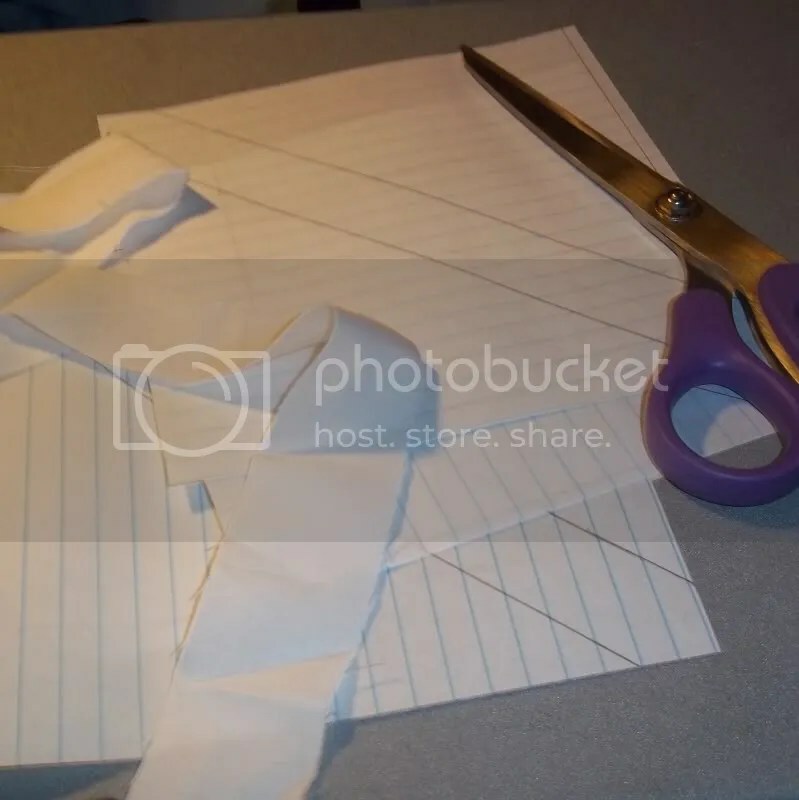 Oh, and speaking of the paper… I use the notebook paper for projects like this because it’s cheap. I’m not going to waste the Carol Doak stuff on blocks that are this simple. More alternating… Are you all getting the idea that this leader/ender thing is really good about cutting back on the waste thread that results from having to stop and start every time we rotate or add on to a block? 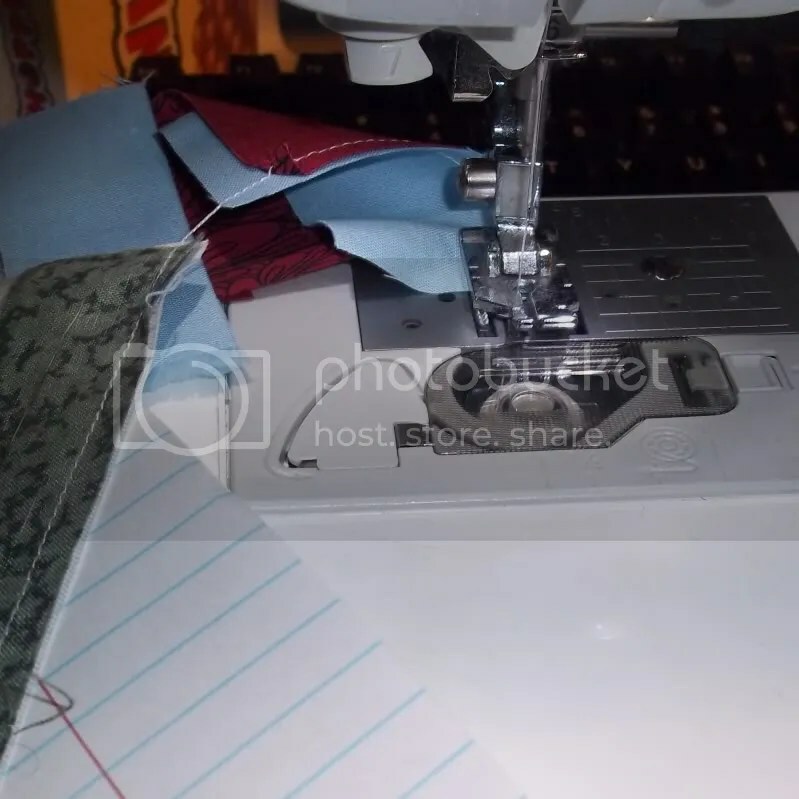 This time, I sewed sewed down along the second drawn stitching line. 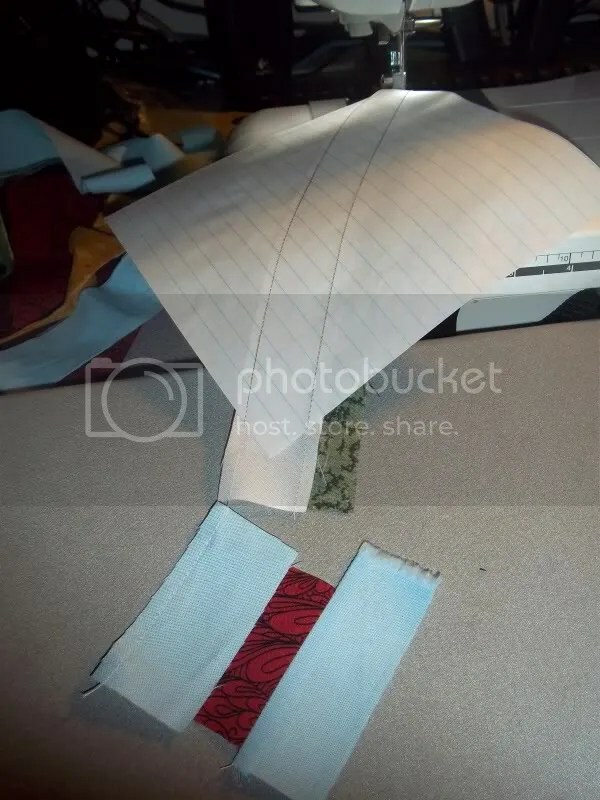 Again, right sides of the fabric should face each other, and the wrong side of the center strip will be flush against the paper. And, yes, I did twist the blocks around to the front of the machine to get a good photo. 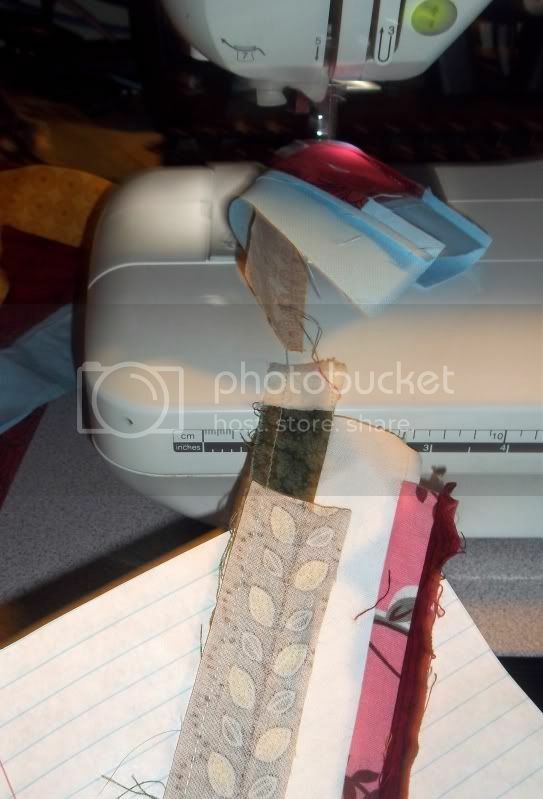 The night I was working on this, I did everything on my computer desk, so directly behind the sewing machine (Bessie), is my computer monitor and keyboard. Stolen moments! I sewed a little more on the primary project, and clipped my string block off the chain in order to iron down the strips. I always iron before adding on to the block, so that I know that I won’t have any puffiness in the block, and thus preventing any pleating to take in any extra. I know they’re scrap blocks, but I can’t help myself. 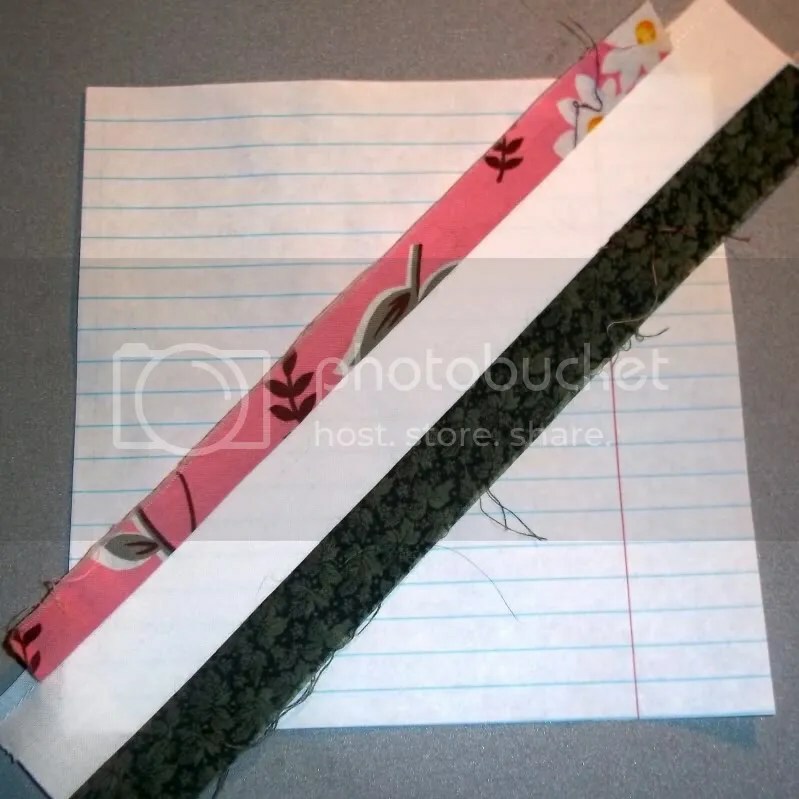 As you can see, there’s extra fabric running over the sides of the paper. Again, I trim down at the end of the process. 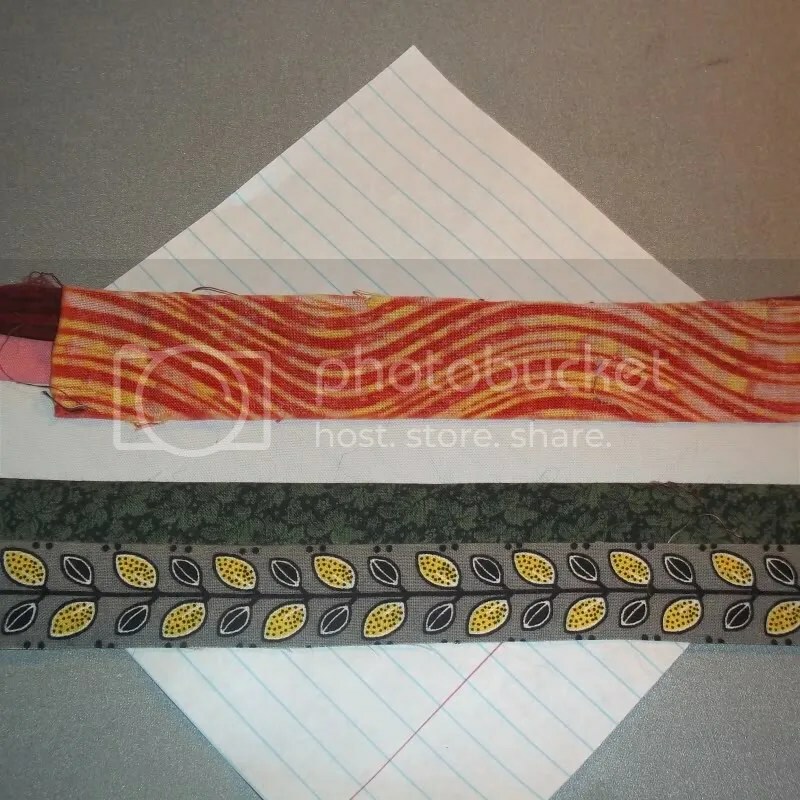 So I pick another strip, and sew it down, followed by work on the primary project. At this point in the primary project, I’d finished the center of the log cabin block and was starting to add the first non-background fabric round. So, I kept going, alternating string block with log cabin block, always checking the next potential strip to be the right length. If it was too long, I just cut off the part that was too long and threw that bit back into the box of scrappy strips. At this point, I’m sure you get the idea. I’ll save you from more progress photos that are essentially the same. 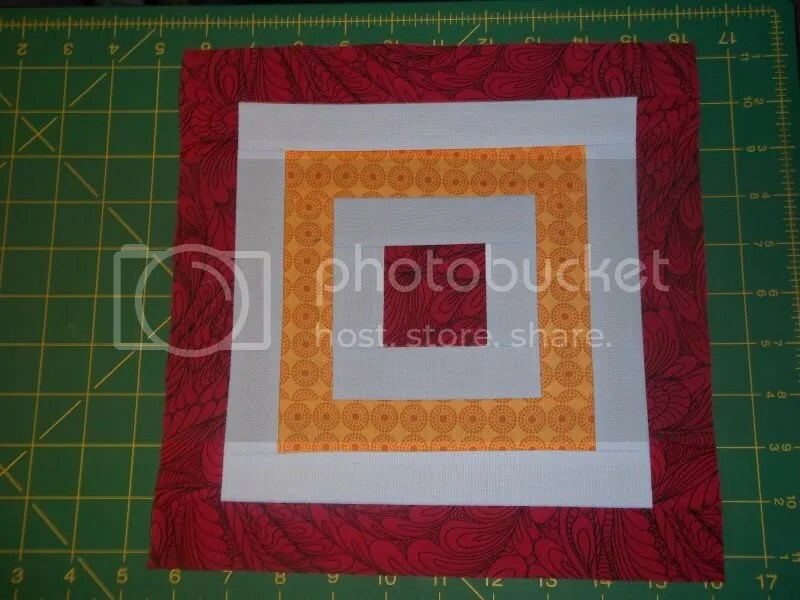 In the end, I had a Log Cabin block, in which I took some artistic liberty and didn’t make all of the non-background rounds from the same fabric. Obviously, you can make these string blocks whatever size you like. You may also use fabric as your foundation. 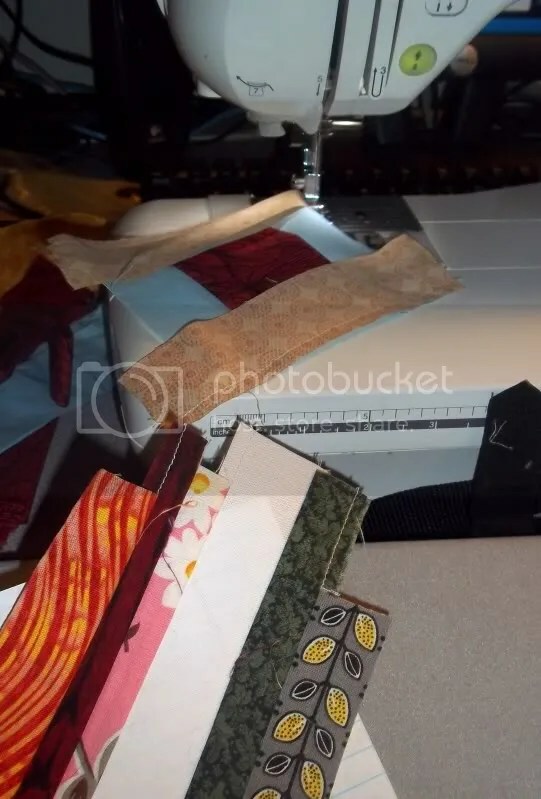 I prefer the paper, so that I can tear it away and reduce the bulk, because I do plan on using batting in this project when I reach the quilting stage. By using paper, I am limited by paper sizes, especially since I don’t like using standard copy or printing paper. It’s thicker and doesn’t tear away as easily. And that’s string blocks, used as leader/ender projects. Don’t you just love how quickly and easily these can come together? That is an interesting idea, but I think its too much multitasking for my brain .. But very productive! Thanks. Used leaders and enders often but never thought to use for strings. Must give it a try! !